Ta-da, here she is, my first skirt from a Japanese pattern book. An hour or two after cutting out my fabric, I had a lovely, elegant, single pleat skirt. I simply followed the instructions for the pleating as planned (well looked at the diagram, it was that clear) then put in the zip and waistband by using the same method plus a bit of common sense. I didn’t line the skirt in the end, as the fabric is a thick linen blend, so from a transparency point of view it should be OK. I was also worried I wouldn’t be able to co-ordinate the lining pleat with the main fabric pleat. I used my overlocking foot with an overlocking stitch (crucial point here) to create this effect on the seams. Thank you very much Gertie for shining a light on that one. I’m so pleased I went for what was probably one of the simplest makes in the book (and you can’t get much more straight forward than an A-line skirt). It came together so easily and has definitely given me the confidence to try another pattern. I suspect a large part of the success of the skirt was the simplicity and elegance of the cut. It looks pretty unprepossessing when you see the pattern pieces laid out, but when sewn together the garments miraculously become very flattering. Simple Chic is a very accurate title for the book. There were a few comments on my last post asking about the patterns and pattern pieces. 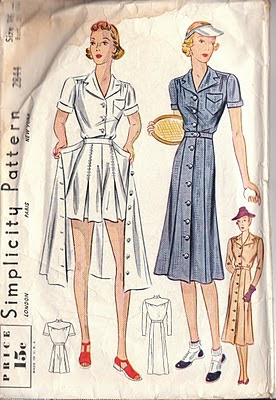 Just to clarify, Simple Chic contains 21 patterns, comprising one pair of trousers, three blouses, 12 dresses, three skirts, one coat and one suit. There are two giant pattern sheets with all the pieces for each pattern printed on. Japanese pattern books cost between £16 and £20 if bought in the UK (Simple Chic is £18), so that’s 21 patterns for £18. When you think a Collette Pattern is around £12 in the UK (and don’t get me wrong, in my opinion well worth every penny), these pattern books are amazing value for money. I’ve had this beautiful Japanese pattern book for a while, but have been scared witless at the thought of making anything from it. I spent hours swooning over the classic, elegant clothes and stroking the lovely, thick creamy paper before deciding a skirt would be the easiest thing to make for a first attempt. Before I started I read up on the subject. There's an excellent article in issue 25 of Sew Hip magazine by Florence of Flossie Teacakes. It's really well written and a pleasure to read. If you're thinking of sewing from Japanese pattern books I'd highly recommend trying to get your hands on a copy as it's a great introduction. After reading it I was filled with confidence about approaching my pattern. Also, by happy coincidence, Kate from M is for Make is running a Japanese Pattern Book sewalong at the moment. Although I’m not officially sewing along (I think I’ve had my fill of sewalongs for a while) I am scouring each post for tips and advice, of which there are many. Here's a big, giant, enormous tip - if you’re thinking of buying a Japanese pattern book, get it from M is for Make. No, I’m not on commission, but as well as having a fantastic selection, each book comes with translation sheets of sewing terms which Kate herself has put together. I can’t tell you how useful they are. Even if (like me), you only manage to decipher a few, it will make all the difference. So here’s the skirt I’ve chosen to make. I love A-line skirts and fancied making one with some detail to it – I like the little pleat at the front. Mine won't be as long as this one, as anything too full and too far below the knee starts straying into frump territory on me. Going by the size chart, my waist size just squeezes into the largest size (13), phew. Expert linguist that I am, I worked out which characters translate as ‘front’ and which were ‘back’. I then tried to translate lots more of the Japanese on the page. Bad, bad idea - I’m not joking when I say my head was physically hurting after about twenty minutes. So I changed my approach. I think as long as you can work out essential translations such as ’front’ and ‘back’ etc, you can piece the instructions together just from the illustrations, which are very clearly drawn. For instance for the skirt pattern, I only really need the instructions for the front pleat - the insertion of a lining, zip and waistband I know how to do myself. Looks terrifying doesn't it? Luckily all pattern pieces are numbered according to which pattern you're making, so it's pretty logical once you've got over the initial terror. I just had to trace them onto tracing paper and voila – I had my pattern pieces. I made a quick muslin, in case there were any fitting horrors before cutting into my nice Goldhawk Road fabric (see first picture). Good job I did because it didn’t do up at the waist (ahem), so I added a bit of width to the top section of skirt and started following the instructions. I've been trying to get my head around Japanese pattern books this week, which I'll tell you about later in the week - hopefully I'll have something to show you too. In the meantime, I finally got round to making a bean bag for my boys. I've been promising them one for ages but things kept getting in the way, sewalongs, vintage patterns urgently needing to be sewn etc etc. I used this pattern which I first saw featured on Kirstie's Handmade Home. It's quite pricey, but it does contain full size pieces and instructions, and it was so easy to make I'll probably use it again to make more for friends - a bean bag would make a fantastic present. It probably took about an hour to sew together and I made it from denim, with a calico insert for the beans. You do need to use upholstery weight fabric as bean bags take an absolute pounding. In fact within five minutes of showing it to my boys, they'd flung it down the stairs and were taking turns to land on it from three steps up. Getting the beans inside the bag was on a par with Laurel and Hardy trying to get their piano upstairs. It's definitely a two person job! 1. Cut out two rectangles of fabric approx 16cm long x 11.5cm wide. 2. With right sides together, pin the two rectangles together. Starting about 2cm from the edge of one of the short sides, sew all the way round until you’re the same distance from the other corner. I use the edge of the machine foot as a seam allowance. 3. Clip off the corners then turn the rectangle the right way round, through the gap you’ve just left. 4. Stick the end of a paint brush, or similar into each corner, so they’re nice and pointy, then iron the seam down across the gap so it’s straight. 5. Fill with lavender - as much or as little as you like. I get my lavender from this company who deliver in super quick time (the next day in the UK). Prices start at £2.10 for a 100g bag (plus postage). Top tip: make sure you keep your lavender in an air tight bag or box to retain the fragrance. If you have a funnel it will come in handy at this stage - I haven’t got one so I just use a spoon. 6. Position either a label or a few inches of ribbon in a loop halfway across the top edge (this gives the recipient the option of hanging it up). 7. Starting at one end and staying quite close to the edge, sew across the gap, backstitching over the ribbon/label for extra strength. That’s it, you have yourself a lavender bag! Seeing Karen's lovely Pendrell blouse at the weekend made me suddenly want to wear my own Pendrell, which I’d made last month and hadn’t got round to wearing. I wore it earlier this week and loved it - it’s really comfortable and gives a plain outfit that little extra bit of oomph. So, like a woman possessed, I decided I HAD to make another one IMMEDIATELY! I’d already decided which fabric to use ages ago – this remnant of flowery fabric I picked up at a Vintage Fair. I’m not sure what kind of fabric it is, probably something synthetic by the feel of it. The girl I bought it from didn’t know either and was so embarrassed about it that she gave me a huge unasked for discount (I got over two metres of vintage fabric for £7 – result!). With the first Pendrell I made a size 10, and although I’d already adjusted the hips on the pattern, I felt it was still a bit loose in the chest. Not so noticeable with the voile but probably more so with the stretchy mystery fabric. So I cut out an 8 for this version and it’s a great fit. I used Andrea’s method of sewing extra bias binding around the neck to create a bow. You simply sew the binding to the outside of the blouse rather than the inside, and leave a couple of lengths dangling to form a bow. Super simple and super pretty. I still can’t quell my fear of looking like Dog Toby, so the seam went unruffled again. I'm really pleased with it, it looks like it was born to be in my wardrobe. The great thing about making second (or third) versions of patterns is that you’ve already done all the dirty work of sizing and adjusting for fit. Plus, you’ve sewn it before, so you know all the tricks. The second time around it’s a piece of cake (in fact this version only took me a couple of hours to sew). I’m not the only one who thinks this way, Tilly’s just finished her third Beignet and Karen’s made three versions of her Woman’s Realm skirt with plans for several more Pendrell’s! I don’t think this is the last you’ll see of this particular pattern…. The front cover doesn’t do the blouse justice. It looks like a pretty plain piece of “sports casual” wear, but don’t be deceived by appearances, it has some delightful details which I discovered as I was sewing it. I made a muslin first and only had to make two changes: I extended the length of the tucks at the front to make it more fitted under the bust and took 1cm out of the back width. The one area where I wasn’t faithful to the pattern was with the buttonholes. If I was being a good seamstress, (instead of a lazy, slapdash one) I’d have made bound buttonholes to give it that perfect period touch. Buttonholes aren’t my favourite thing at the best of times, and bound ones look so time consuming that I guiltily just made normal ones. I finished the blouse with some vintage flower buttons from my stash. The instructions were a delight – lovely clear steps accompanied by little illustrations. They were much easier to understand than some modern day patterns, even with unprinted pattern pieces. Ah yes, unprinted pattern pieces…. when I first opened the pattern I thought, in my naivety, there had been a printing error i.e. they’d forgotten to print any writing on them. Duh, all the relevant circles, grainlines etc are punched onto the pieces and you then work out what’s what from the instructions. It sounds complicated but it really isn’t, it’s actually a very efficient way of printing a pattern. Fabric-wise I used a beautiful double gauze I treated myself to before Christmas from this Japanese website. As soon as I saw it, I knew exactly what I was going to make with it because the pattern looks so 1930’s. The print is actually little rabbits, but you can’t really make them out unless you’re close up. Double gauze is a strange fabric. It’s basically two layers of gauze held together by a grid of tiny stitches. This particular double gauze is reversible, so the other side of the fabric looks like a negative, which I quite like. It’s a lovely texture, somewhere between brushed cotton and linen and the drape is nice and heavy. Oooh, who’s the swinging blonde? …it’s me, in my swing dress!!! Of the four sewalongs I’ve participated in, this one, run by Casey, has taught me the most about dressmaking. To be honest, I’d had my fill of sewalongs, but when Casey announced she was running one for the Swing Dress, I couldn’t resist. Having admired her three previous versions of the dress from afar, I couldn’t pass up the opportunity to make my own. The way it worked was that Casey chipped in with posts on the tricky areas and then left us to get on with the everyday/boring bits on our own. This is much more my way of working and I learnt so much, both in terms of dressmaking techniques and invaluable and fascinating snippets about 1940’s fashion. So, what did I think of the pattern? Sense and Sensibility, who produce the pattern, also print patterns for Regency style gowns so they're good on authentic period detail. I think that’s what I liked about this pattern. What I didn't like was the instruction for sewing the gathered shoulder. Talk about confusing, it was a nightmare - but that’s when making a practice muslin (along with Casey’s expert instructions) came into its own. I’d never have managed to work them out for myself, and having practiced on the muslin first, it all made much more sense when I came to sew the real thing. Much to my surprise, the fit was unexpectedly good (I was expecting the worst after my Crepe dress fitting debacle). The bodice is designed to accommodate long-waisted ladies (not me) so I knew I’d have to shorten it. I also shortened the back, as well as reducing the back width. On Casey’s advice, I also reduced the amount of ease in the sleeves which worked like magic when it came to attaching them. Apart from shortening the skirt pieces, I didn’t have to make any other adjustments. So what did I learn from Casey during the process? 1. How to fit a gathered shoulder to a bodice. 2. How to reduce sleeve ease on a 1940’s style. *I abandoned my effort at inserting an invisible zip after I inserted one pretty well and then discovered I’d put it in UPSIDE DOWN. That was one of the few times in my life I wish I smoked. I had to make do with a few deep breaths instead, having briefly contemplated taking to the bottle. 4. How to topstitch a midriff piece so it looks perfect. The sleeves are probably the feature I’m most proud of. I chose the three quarter length sleeves and they’re so flattering, they've even got little elbow darts. I can see why the top fabric recommendation on the pattern was crepe, it’s absolutely perfect for this type of dress, very drapey and swingy. It’s not bad to sew with either, if you can grit your teeth against the fibres that go EVERYWHERE once you cut into it. The wool crepe behaved itself beautifully, despite my early misgivings. I’m still a little nervous about wearing it to my brother’s wedding – as long as I’m on my guard against rain, hot sun, a hot iron and spilling a drink down myself, Airplane-style, I should be fine. PS. Apologies for the rubbish, shaky photos, it was too cold to get undressed and re-do them!